"Famous for their ability to cleanse the blood, treat infections and eliminate parasites, beets also contain betaine, which is able to detoxify the damaging amino acid homocysteine"
You may be surprised to learn that historically, it was the leaves of the beet that were first consumed for sustenance, while the root was thrown away. The ancient Romans were the first to notice the edible qualities of the beet root, which grew in popularity around the 16th century. Once it was discovered that beets had a high sugar concentration, Napoleon beautified the beet by decreeing it be used as the primary source of sugar production. After that, everything changed for this humble red root, which later emigrated to the gardens of North America, to be planted alongside the likes of carrots and cucumbers. Over fifty years ago, Dr. Alexander Ferenczi of Hungary began treating inoperable cancer patients with a simple diet of organic beet juice and shredded raw beets. Amazingly, 21 out of 22 patients experienced a reduction of tumor size and were able to gain weight. Recently, it has been shown that beet extract acts as a powerful inhibitor of liver, lung and skin tumors in mice. Famous for their ability to cleanse the blood, treat infections and eliminate parasites, beets also contain betaine, which is able to detoxify the damaging amino acid homocysteine, which has been shown to increase the risk of heart disease. Beet greens are a good source of carotenoids, which help in the prevention of all types of cancers. They are also high in manganese, an important mineral for brain function. As with many of the phytochemicals in plant foods, there is still much to be discovered about how the wide array of micronutrients found in beets are able to protect and maintain human health, so stay tuned. Wash beet root well with hands, removing all dirt, and rinse leaves. Juice roots, stems and leaves, and watch as a stream of richly colored juice pours out. By now you should know that bright color means powerful antioxidants. When juicing beets with a centrifugal force type juicer, alternate between pieces of beets and carrots; otherwise, the beet pulp tends to build up on the side of the spinning extraction basket and causes the juicer to vibrate. With the masticating juicer, alternate between beet and apple to keep the pulp running smoothly, creating less strain on the motor. 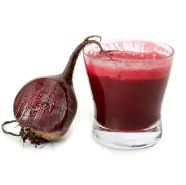 Do not be alarmed: beets cause the stool to turn red and may give the urine a reddish tinge. This is harmless and completely normal. If you stain your counter red with cutting and juicing, wipe it with lemon juice or a few drops of bleach, and it’ll be as good as new. Bottled lactofermented beet juice is fermented with lacto bacillus, turning it sweeter. On a juice fast, this delicious juice is like champagne. Find it at your local health-food store. It’s not hard to pick a perfect beet. Purchase firm, rock-hard beets with crisp, deep green leaves, still attached if possible. The root can be stored for months in the refrigerator. Beet greens should be covered if not used within a day, and will keep for about 4 to 5 days in the refrigerator. As with all greens, the sooner you juice, the better the nutrition provided, especially vitamin C.
Beet juice is very concentrated. Do not drink it alone. Dilute with a milder juice, such as carrot or apple. I'm glad for the site,I was told by a produce employee never use the leaves, of beets for juicying. I see my Physcian he tells me years ago he enjoyed this entirety of the juice, leaves included. He stated he thought it was safe, so I needed to know for sure, your site gave me the information I needed & much more. Alternating between the vegetables and fruits and the skin & root. I would have thrown out most of my product out. Thank you so very much. I didn't know that one could juice the stems and leaves too! I am so very grateful for the information you have given me today. Thank you! so happy to know this since I have been juicing them with carrots, apples, and chard for the last 3 weeks and realized I wasn't sure about the safety of doing that. In order to obtain optimal enzymes, minerals, and vitamins, it is paramount to be knowledgable about juicers and describe how some create heat and kill the enzymes you are working so hard to obtain or they don't get the juice out of the pulp and most gets thrown away. I love your website.It s very organized and informative. I know quite a bit about juicing and doing it fulltime now. Arthritis is a biggy for me and I juice ginger root: 1/4 glass a day straight with milk or water. It works super. I also use a Champion juicer which is really good. Hope to learn more and I juiced swisschard straight out of the garden this morning. What a difference. Anyways, good luck. I love yr website.It s very organized and informitive,(excuse my Duth). I know quit a bit about juicing and doing it fulltime now.Arthitis is a biggy for me and I juice ginger root.1/4 glass a day straight with milk or water.It works super.I also use an Champion juicer which is realy good.Hope to learn more and I juiced swisschard straight out of the garden this morning.What a dif.Anyways good luck.lv Bert.